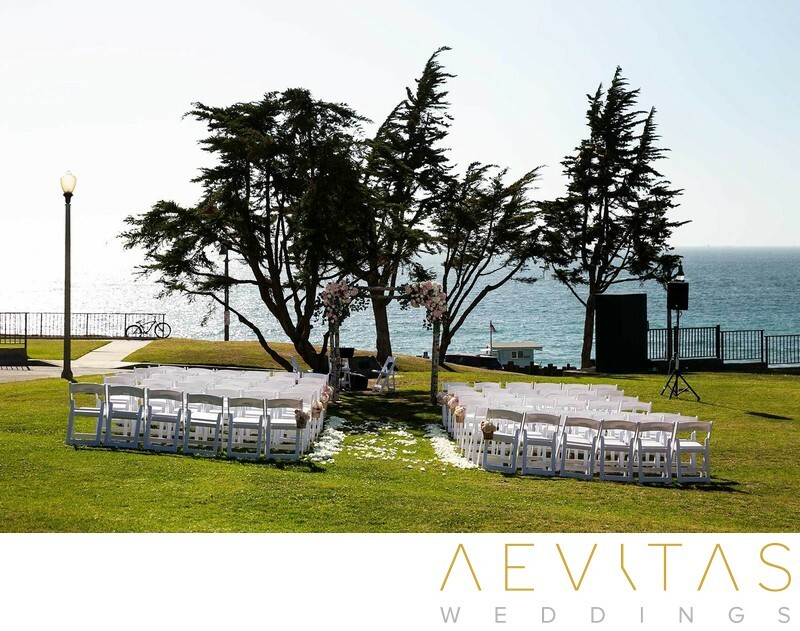 Built by local architect, Lovell Pemberton in 1930, the Redondo Beach Historic Library combines classic elegance with beachside breezes for an undeniably romantic wedding day ambiance. It boasts magnificent views over the Pacific Ocean and nearby Veterans’ Park, as well as ornate Spanish and Dutch colonial architectural styles in its three-story construction. Your guests will be greeted by the Redondo Beach Historic Library’s impressive wooden doors, with ornamental ironwork around the arched surrounding windows and Art Deco features across the building’s facade. As noteworthy as the building itself is the sprawling Moreton Bay Fig that overhangs the Redondo Beach Historic Library and is a registered landmark in its own right. Couples can exchange vows on the expansive grassy lawns at the back of the library or the Veterans’ Park concert green. Or if you prefer an interior space, the main floor’s beautifully-illuminated room offers gorgeous ocean-facing views and the capacity to host up to 150 guests. Neutral-colored walls allow you to add your own florals and decorations, while the dark wooden beams, arch ways and circular brass lamps create a stately elegance. The same room can be transformed into a lavish reception venue, with long tables running down its length and bracketed bookshelves along the walls. Uplighting can be used to enhance this already cosy space and a dance floor setup for you and your guests to party well into the night. With only one wedding scheduled per day, couples have exclusive use of the Redondo Beach Historic Library throughout their wedding event. Catering is provided exclusively by Spectrum Catering, with full bar amenities and service staff included in wedding packages. For lovers of books wanting to combine this passion with an atmosphere of classic-inspired elegance, a tour of the Redondo Beach Historic Library will affirm why this is one of Redondo Beach’s most popular wedding day venues.